Dr. David Marshall has confirmed the present painting to be by Viviano Codazzi with staffage by Domenico Gargiulo. He dates the painting to 1642 or 1643, around the same time or a little earlier than another view of the Villa in the Musée des Beaux-Arts, Besançon, (fig. 1, see D. Marshall, p. 104, cat. VC 27, illustrated p. 105). Viviano Codazzi was one of the most renowned architectural painters of the Italian Baroque period. Originally from Bergamo, he moved to Rome in his 20’s for his apprenticeship. Rome was the city of the moment, Caravaggio had just left in 1607 for Malta, but his paintings were all on display in churches and palaces ready to give inspiration to any young artist that would look at them. Codazzi was fascinated above all by all the ancient ruins that he could encounter around the city. 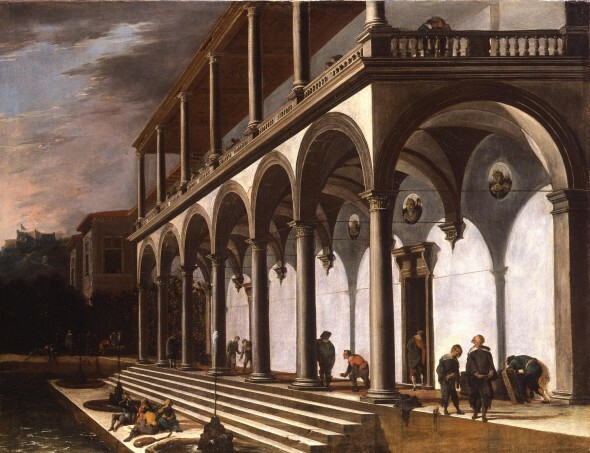 In 1633 he moved to Naples where he worked with Cosimo Fanzago on commissions for the Certosa di San Martino. To this period belongs the important commission of paintings for Philip IV’s Buen Retiro Palace in Spain, which was the fruit of the cooperation with Domenico Gargiulo, who gave life to Codazzi’s magnificent architectures. The present veduta is one of few representations of the Villa Poggioreale built by the Florentine architect Giuliano da Maiano for Alfonso II of Aragon (begun 1487, now destroyed). The Villa represented one of the most important examples of Florentine quattrocento architecture outside of Tuscany, and was not only highly influential in Naples but even as far north as Rome. In the present composition the Castel dell’Elmo, with part of the Certosa di San Martino (where Codazzi was working at the time) is visible on the hilltop in the distance. While the distances between the Villa and the Castel dell’Elmo are compressed, the topographical relationship is quite correct. There are some differences between the present composition and one in Besancon which may in due more in part to artistic licence than anything else. In fact, an engraving of 1629 by A. Baratta (see fig. 2) shows the loggia of the villa with eight archways, while the present canvas shows six and the Besancon picture shows seven. The Villa functioned as a popular and semi-public playground. The count of Benavente made the villa more accessible by enlarging the streets leading to it and decorating them with fountains. Both the upper and lower classes could pass their days walking and picnicking in the gardens and even fishing in the fishpond.